Diabetes is a serious illness where there is a persistently high glucose level in the bloodstream. Glucose (blood sugar) is the primary source of energy for the cells in our body, and diabetes occurs when the glucose level is not regulated properly by the hormone known as insulin. When these signs are associated with diabetes, they are the result of high glucose levels in the body. If you notice any of the above signs, schedule an appointment with your family doctor. 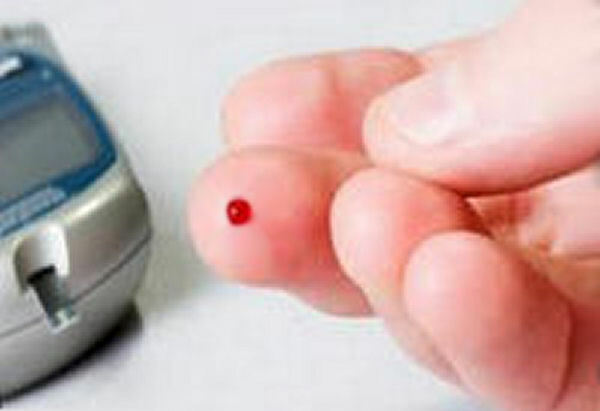 Blood tests will be able to tell you if you have reason to be concerned about a diagnosis of diabetes. Type 1 diabetes occurs when the body does not produce any insulin on its own. Type 1 diabetes has often been considered a childhood problem, but it can also develop in adults. This form of diabetes requires regular insulin injections for survival, and there is currently no known cure. Type 2 diabetes occurs when the body becomes resistant to insulin or when there is an insulin deficiency. This type of diabetes can often be managed with regular exercise and a proper diet. The nutritional components of Apple Cider Vinegar help control the rise in blood sugar levels when you eat a meal. Take 2 tablespoons of apple cider vinegar and add a pinch of salt to it. Drink this before every large meal. Supplements containing essential fatty acids, such as Flaxseed Oil, can help repair the cellular damage caused by a lifetime of high sugar consumption. Rich in vitamins, minerals and other nutrients, Alfalfa makes an amazing herbal remedy to lower blood sugar levels. Take one teaspoon of Alfalfa seeds and sprinkle them on every meal you eat. Alfalfa capsules can also be taken following the directions on the package. Research has shown that small doses of Cinnamon can be beneficial in treating Type 2 Diabetes, since it can reduce blood sugar levels while simultaneously increasing the body's natural production of insulin. Take half a teaspoon of Cinnamon powder each morning. Sprinkle cinnamon into your coffee. Add a cinnamon stick to your favorite herbal tea. Mix cinnamon powder into unsweetened applesauce. Add cinnamon powder to your cereal or oatmeal. NOTE: If you are taking medication to control blood sugar levels, any regular consumption of cinnamon should only be taken after consulting with your doctor. Whole foods such as fruits,vegetables, grains, beans, nuts, and seeds are rich in fiber and other nutritional factors that help stabilize blood sugar levels. Eat at least five fruits every day. Fruits like banana, blackberry, blueberries, cranberries, figs, grapefruit, pomegranate juice, granny smith apples, kiwi fruits, and citrus fruits are highly recommended. Try to eat every color from whole foods each day to control high blood sugar levels. Excellent vegetables include artichoke, black beans, cabbage, carrots, cucumber, garlic, lettuce, onion, radish, string beans, tomatos, spinach, squash, turnip, and brown rice. Obesity is one of the main causes of diabetes. Most people with Type 2 diabetes are 30 to 60 pounds overweight. For them only losing this excessive weight can control their Diabetes. Muscle building and weight training can play an important role in Diabetes control. Having more muscle and less fat reduces the insulin intake requirement. Taking a brisk walk for about 45 minutes each to 1 hour each day helps normalize body weight. It can also help correct insulin resistance which is the main problem in Type 2 diabetes. 10 to 40 minutes of Yoga each day can help to relieve stress, which is a contributing factor for Type 2 diabetes. If you exercise everyday and are taking insulin injections, you should monitor your blood sugar level closely since exercise may allow you to cut down your insulin by 30 to 50 percent. 1 Nobel-prize winning ingredient that boosts your immune system. 3 critical ingredients that help to clean acids from your pancreas, which helps slash your blood sugar levels. 5 other ingredients that help your body remove waste, charge your immune system, and produce insulin. Click here to find out how these remedies can help you in a few weeks rather than months. Thanks for sharing home remedies. Black Plum or jambul, also known as jamun contains anthocyanins, ellagic acid, hydrolysable tannins and each part of this plant (leaves, berry and seeds) can be used to help lower blood sugar levels. Hello. My family doctor had prescribed me with insulin but I hesitated to start injecting insulin. 3) Fennugreek seed powder and leaves. I'm not sure what is biological name of Kawasiya. After starting the ingredients mentioned above, my blood glucose level spiked for five days and I was little nervous with the effects. But starting from the 8th day of starting this home remedy, my BGL reduced dramatically to normal range. I had a few more than normal bowel movements which also helped a lot. After 2 months of using this remedy, my lab blood report was much better. I didn't need to take insulin and now very rarely do I take my tablets. My diet is quite normal like others but I have restricted junk food consumption. The reason I'm posting my comment is, I feel above ingredients can also help others. Please try this home remedy. I hope it will help you too. I knew that I have diabetes, but I didn't know what caused it. This article helped me in a great way - thanks for writing the best piece of information! Hi there, I would love to learn more about natural treatment of diabetes from you all. Hi, I knew that taking 1-2 tablespoons of apple cider vinegar works for too much of calcium deposits in your bones. My blood sugar level is high usually in the morning. I was at 10.1 last night before bedtime. I took 1,1/2 tablespoons apple cider vinegar with one tsp of Stevia in 8 oz of hot water this morning. My left shoulder was very tight and now I can move it better. I checked my blood sugar and, wow, it's at 8.0. I feel much better! I eat about 5 fruits a day also I'm taking 500 mg of Meliform 3 time a day. So by taking apple cider vinegar, this should help me get off the meds or will it stay with me always? I walk on an average of 8 km a day and my HbA1c is 7.15. Please suggest some natural home remedies to control HbA1c and to bring it down to 5.5-6.0. With regards, Srikanth. @Kavya, my mother also has hypoglycemia and at times her blood sugar levels drop suddenly. She always carries some sort of snack or food with her and eats something at very regular intervals, usually after every two hours, which has helped her a lot. Hope it helps you too. Good luck! Hi, I suffer from hypoglycemia usually at night or early morning. Even though I eat a proper dinner, but by 6:00 am I can't wake up since my sugar levels get too low. I couldn't work and had to leave my job and am not working for the past 4 years. I got another job now but I'm worried that what would I do if I get low sugar levels at work? Please suggest whatever may help. Thanks! @Bibhuti Thakur I would recommend you to go for a proper diet and workout plan because only taking medicine wouldn't be that much effective but if you follow a diet and workout plan. I am sure you will get better much faster. Also instead of going for any chemical medicine go for a herbal one.